Are you f^&*ing kidding me, Karl? Are you serious? Poor Karl and his friends can’t screen us out anymore. You can’t scan the bumper stickers of the cars riding into the parking lot because we don’t need them. You can’t confiscate the signs because we don’t use them. You can’t screen us out by the way we dress, we’ll look indistinguishable from your donors. In fact, even if you could screen us out, you can’t screen out the audio engineers or the servers circulating with appetizers. You can’t get away from us, Karl. We have the right to occupy America because we ARE America. And when we’re done speaking, we’ll give you a chance at the Q&A session immediately following. You can not evict an idea whose time has come. Like I said about the Family Research Council prayer thing, what kind of person would want to dash the hopes of the poor and middle class in their struggle against the rich? Why don’t we ask Karl Rove? Massachusetts Democratic Senate candidate Elizabeth Warren drew about 1,000 supporters Sunday at a rally in Boston. “The daughter of a maintenance man who made it to be a fancy pants professor at Harvard Law School. America is a great country,” she said to the audience, who had pledged to volunteer for her campaign at the Reggie Lewis Track and Athletic Center in Roxbury. The turnout was remarkable for an election that is nearly a year away. The Boston Globe reported that her campaign said her opponent, Sen. Scott Brown (R-Mass. ), has been drawing crowds of 200 to 500 at recent events. The Huffington Post’s Ryan Grim reported on another recent volunteer event where Warren was heckled by a Tea Party supporter. I would hesitate to call her bullet proof because there will always be an gullible contingent of voters and rabid nutcases who will find something they will turn into a kerning moment. But she’s smart and she will learn much more quickly than other people in her position. What more can we expect from Karl? Probably personal details. Everyone’s got’em. And then there’s the subtle misogyny. You know it’s coming. And then there is the time issue. As long as she’s the only featured candidate of the downtrodden middle class, she’s going to get the focus and relentless pounding. What we need are some other challengers for Congress and the Senate who will join her. Then Karl will have to play whack-a-mole. Imagine 435 moles popping up all over the place and Rove having to spend the money to smack them all down. How delightful. Ahem, if you would like to contribute to Elizabeth Warren’s campaign, see her donations page here. And don’t forget Al Franken who has consistently supported Net Neutrality. His defense of New Neutrality last week is clear and eloquent. Do yourself a favor and listen to the first 10 minutes. There has never been a better case for Net Neutrality nor better examples of what might have happened to the things we take for granted now if Net Neutrality hadn’t been in place since the internet was rolled out to regular folks in the early 90s. Reward good behavior. Check Franken’s page for more support of what you like. We are making progress, not that The Plum Line is paying any attention to this number (yet). BTW, Paul Krugman congratulated a writer for scoring a gig for an online journal. It was Matt Yglesias and he will be writing for Slate. Slate must have been concerned about the number of male opinion writers it had and took affirmative actions to address this lack of diversity. How are power relations shaping the U.S. political sphere? From the primary campaign to the tea parties and the raucous healthcare forums, Americans are out in force. Regardless of their political stripe, are their actions in their own best interest or are they being played? What influences are determining how people perceive the issues, what aspects of the issues are open to debate, and what aspects are not open for consideration? Whom is mobilizing whom and for what? Steven Lukes, in his classic “Power: A Radical View” offers a framework for analyzing the types of power relations that shape policy and society within democratically-oriented nations. The overly simplified summary that follows is intended as a tool to direct our discussion. Power, oversimplified, is the capacity of individual or collective agents to achieve their intended outcomes by getting others to act for these outcomes, even when these outcomes are against their own best interests. In achieving these outcomes the three dimensions of power tend to function in a complimentary fashion. The first dimension of power is the capacity to realize one’s aims in decision-making situations. This is the capacity to acquire a representative majority, whatever form that may take, be it a simple plurality or a Presidential veto. For example, the Democrats now control the House, the Senate, and the Presidency because they acquired a representative majority in all of these areas in the last election. The second dimension of power is the capacity to determine the agenda, that is, the scope of decision-making situations. This is the capacity to contain and direct deliberation within parameters wherein first dimension power can be exercised to achieve one’s aims while concurrently foreclosing considerations that could undermine one’s first dimension power. An example of the second dimension of power at work is that President Obama and many ranking Democrats, even with their filibuster-proof majority, have effectively excluded single-payer from the healthcare reform options. Propaganda, i.e. political spin and sloganeering, for example, exists to seep, and/or be ground into, people’s consciousness to influence their decision making, as Goebbels noted. “Government should not interfere with business“, “Socialism (or capitalism) is evil”, “Free trade brings freedom”, and “Healthcare forum disrupters are all astroturfed Republicans” are examples of such sloganeering propagandizing and Rove and Axelrod practise propaganda architectonics. Social signs of third dimension power relations include overtly inequitable distributions of natural and cultural social goods within a community; a relative acceptance of these social relations among those disadvantaged by these relationships; and evidence of mechanisms in play that have prevented the disadvantaged from perceiving their circumstances as potentially otherwise. From the perspective of a single payer advocate, for example, I perceive the clusters of people who are making statements about keeping the government out of Medicare as being in the same boat as those who are pushing for Obama’s bait-and-switch private insurance debacle while thinking they are getting a publicly-funded cost effective model. Both groups are actively working against their own interests. Assuming that the three dimensions of power are alive, well, and very much involved in the continuing mass transference of wealth from the middle class to the elite, what can be done to reverse this trend? As bloggers, and blog participants, what can and should we do? Sunday Late Night: What’s Happening? We’ve had a couple of really serious discussions today. How about looking at the lighter side of politics for a bit? If you’d like to imbibe some liquid or chemical refreshment, please feel free. I had to quit all that stuff more than a quarter of a century ago myself. Now I’m just high on life! Actually, I’m a complete political junkie and internet addict, in case you hadn’t noticed. President Obama looked surprised when Mr Chavez got up from his seat, handed him the book and then shook his hand. It was a Spanish-language paperback copy inscribed with the message: “For Obama, with affection”. President Obama endured a 50-minute diatribe from socialist Nicaraguan President Daniel Ortega that lashed out at a century of what he called terroristic U.S. aggression in Central America and included a rambling denunciation of the U.S.-imposed isolation of Cuba’s Communist government. Obama sat mostly unmoved during the speech but at times jotted notes. The speech was part of the opening ceremonies at the fifth Summit of the Americas here. Ortega denounced the U.S.-backed attempt to overthrow Fidel Castro’s new Communist government in Cuba in 1961, a history of US racism and what he called suffocating U.S. economic policies in the region. In his 17-minute address to the summit, Obama departed from his prepared remarks to mildly rebuke Ortega. Actually, the president misspoke on the sequence of events in Cuba. The invasion of CIA-trained rebels at the Bay of Pigs in Cuba occurred in April 1961. Obama was born August 4, 1961. As Jangles pointed out in a comment on the previous thread, once again Dear Leader is confused about the timing of public events in relation to his birth. Perhaps if he didn’t have to reflexively make everything about himself, he wouldn’t repeatedly make these kinds of mistakes. While I was perusing the Fox News website, I came across this hilarious story about Vice President Joe Biden: “Rove Calls Biden ‘Liar’ After VP Boasts of Scolding Bush.” Apparently the gaffe-tastic Mr. Biden told this story on CNN recently. Karl Rove is having none of it. The exchange is purely “fictional,” said Rove, who was Bush’s top political adviser in the White House. “It didn’t happen,” Rove, a FOX News contributor and former Bush adviser, told Megyn Kelly in an interview taped for “On The Record.” “It’s his imagination; it’s a made-up, fictional world. OK, I can’t stand Karl Rove, but that’s funny. In 2004, Biden told a similar story on Bill Maher’s show. Hmmm…I wonder if Biden would have the guts to talk to Dear Leader like that? So what are you reading/watching/hearing tonight? If anyone is still around, that is. I keep forgetting that only in Massachusetts is tomorrow a legal holiday. Patriot’s Day. It’s the anniversary of the Battles of Lexington and Concord–the beginning of the American Revolution. Nowadays we just have a marathon and an early baseball game. 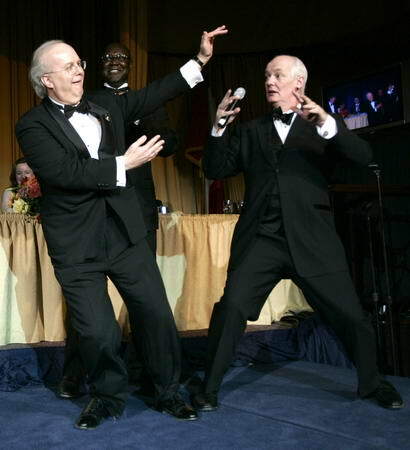 MC Rove dances at the WH Correspondents Dinner in 2006. A date that will live in infamy. Karl Rove says that McCain couldn’t compete against Obama’s money advantage. Karl forgets that the media also fellated Obama while destroying the intellect of Sarah Palin, the DOW took a dive at a most conveeeeenient moment (Thanks, Wall Street!) and Flight Jacket Thrill Bush had the lowest approval rating in history. It’s quite possible that Dennis Kucinich could have won against McCain. Obama continued his lucky streak in November. He has an uncanny knack for winning on everything but merit. Karl says “follow the money” in his column in the WSJ called McCain Couldn’t Compete with Obama’s Money. Hmmm, you could read more than one meaning into that headline. But let us assume tha Karl is referring to the $250,000,000 advantage Obama had in October and November and the fact that *today*, both campaigns have to spill the beans to the FEC about where it all came from. On May 31, as the general election began in earnest, the Obama campaign and the Democratic National Committee had a combined $47 million in cash, while the McCain campaign and the Republican National Committee had a combined $85 million. Between then and Oct. 15, the Obama/DNC juggernaut raised $658.7 million. I estimate today’s reports will show Mr. Obama, the DNC and two other Obama fund-raising vehicles raised an additional $120 million to $140 million in October and November, giving them a total of between $827 million and $847 million in funds for the general election. Nearly a billion dollars. Imagine how many foreclosed properties in Chicago that would have saved. Whoa! That’s a lot of ad time to fast forward through on the DVR. Karl is giving too much credit to ad time. It may have given Obama the air of inevitability but I don’t think it would have worked so well if there weren’t other factors in his favor. I think Karl doesn’t want you to pay much attention tot he other factors that I mentioned above. The Republicans were WILDLY unpopular. If it weren’t for Rove, Obama could have never have carried it off. Then Karl gets to the point: McCain was hoisted on his own petard. One can almost detect a note of glee that McCain was done in by his own campaign finance reform. Karl pronounces it dead and predicts that no candidate will ever make the mistake of going with public financing again. It’s going to be one giant pool of money for each side. There will be ad buys the likes of which we have never seen, GOTV efforts that will annoy even the most committed voters, a Greek temple for every pol. But the fact remains that Obama got only about 1/4 of his money from small donors of $200 or less. The rest came from the same fat cats that have always contributed to campaigns, except that *this* year, they switched parties to the tune of about $500,000,000. That’s a lot of money from untraceable debit cards. Karl must be secretly admiring Obama. Maybe he’s seen Obama in a Flight Jacket. Heck, for all we know, he gave David Axlerod the idea to use the prepaid debit cards in the first place. It could happen. Karl is right about one thing though: we need to see where the money came from. In this day and age, there is simply no excuse for not being able to publish this information instantly. The technology is there. Let’s see just how much money those fictional characters pitched in and by what means. It’s only fair, especially now that Bill Clinton has had to cough up the list of donors to his library. In fact, Obama would look like a hypocrite if he didn’t let us examine his books. I mean, we *PUMAs* know what a corrupt politician Obama is but the rest of the progressive blogosphere who went on ad nauseum about how resilient Obama was to corporate cash will not believe it until they see proof. Ok, they might not see it even then but maybe we can get them to shut up about the Clinton library and Global Initiative, which looks positively modest and beneficent at this point compared to Obama’s obscene amount of campaign cash. The end does NOT justify the means, Obots. Obama ruined our primary system, our campaign finance system and our right to self-determination. He’s really no better than Bush and Rove in that respect. He may be the president next year but we will remind ourselves *daily* about how he got there. I found this video on Design*Sponge, one of my new favorite sites. It takes you through the process of making homemade peppermint marshmallows. What a great idea for a cold Saturday afternoon in December.